The aim was to provide introductions on investment, mentorship, legal, PR and brand advice to the companies below. Chief Dragon Jonathan Russell is a veteran private equity guru and a partner at Spire Partners, who has been an investor for 25 years (and has never made anyone cry, he claims). Jonathan is also the Co-Chair of the Luxury Law Summit with the indomitable Barbara Kolsun. Managing Dragon: Kari C is an entrepreneur, designer and couture shoe designer who runs her collective of designers, operates a manufacturing business and is involved in helping companies with investment. She will facilitate introductions to those pitching, particularly anyone in the audience who would like to help the companies. Those expressing an interest should approach her at the end of the pitches. Dragon Advisor: Brent Richards is a creative provocateur academic and design consultant in the new field of Food Architecture, Design Anthropology and Gastronomy. Previously he was Dean of Design Central Saint Martins School of Art & Design Founder and Executive Director of Design Laboratory innovation centre UAL.He is currently founder | creative director of The Creative Archipelago – international transdisciplinary design consultancy. 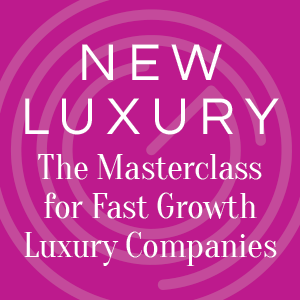 Brent also course leader MA Design Innovation – Future Luxury @ Ravensbourne London. As co-founder of Brand Love, Non-Exec Director of Ethical Fashion Group and previously CEO and MD for leading brand, innovation and trend agencies Sally O Rourke is an expert at creating consumer brands. Previous roles include CEO Bluemarlin, Managing Director of Europe for c_space working with clients such as Coke, McDonalds and Kimberly-Clarke and as Managing Director EMEA for WGSN, the world’s largest trend agency where Sally worked with clients such as L’Oreal, Coty and Inditex. Catherine Thomas is also a co-founder of Brand Love as well as being a Non-executive Director of technology company Soundout. She has worked in marketing, PR and communications for over 20 years, across retail, beauty, fashion and luxury brands, real estate and investment management in the UK, Europe and Middle East. Catherine has worked in brand strategy for Charlotte Tilbury Beauty, Debenhams, Jaeger, Maria Grachvogel, Land Securities Plc, Sainsbury’s, and is currently a consultant to The British Fashion Council and The Future Laboratory. She holds a BA in Politics, Philosophy & Economics. She is currently working as a consultant developing the retail brand strategy development for a number of UK retail and fashion and beauty businesses. Lisa Tse is a creative businesswoman, designer and brand consultant, founding a range of business ventures including a signature brand agency Lisa Tse Ltd, concept art studio Opus Artz, and The Sorority– a pioneering private members society of influential women ranging from business leaders to royalty.Lisa specialises in luxury brand development and communication, equipped with a multi-disciplinary talent that works with companies in a creative and commercial capacity to develop outstanding brands. Jayne Alexander is Managing Director of the Dovetail Agency which she founded. She has over 20 years of experience within the lifestyle and travel sector, having worked for Inter-Continental Hotels and The Virgin Group before launching The Dovetail Agency. Her experience includes a launch project for The Virgin Group. Virgin Ultimate was developed as a luxury collection of UK and international properties. Each hotel or resort was required to meet a high standard in order to be aligned and promoted alongside Necker Island and La Residencia. Virgin Gift Cards were developed from Jayne’s own initial business idea, as presented to Richard Branson. They were designed to generate incremental business for The Virgin Group, and as forecast achieved target within 18 months. The company was sold after five years for £15 million. Bestselling author, activist, entrepreneur and philanthropist, Paola Diana is the founder and chair of Diana Group, specialising in the recruitment and lifestyle management sector through subsidiaries Sigillus, Nanny & Butler and SupremePA. Paola has established herself as one of the leading lights in the literary world having recently published a book ‘Saving the world. Women: the XXI’s Century Factor for Change’. Jo Rogers is founder of NaviStar Legal, a company that provides in-house legal support to small and medium-sized businesses. Having worked as a corporate lawyer in the city, an inhouse lawyer at American Express, she now works with start-ups and entrepreneurs and has helped hundreds of start-ups and small companies to raise millions in investment and to close numerous deals on terms that work for them. Her vision at NaviStar Legal is to create a ‘tribe’ of the best lawyers around the world that provide wisdom to these businesses. The idea behind Tengri was conceived by Nancy Johnston when she was travelling with friends and staying with herder families in Mongolia. Nancy became fascinated by the delicate and interwoven relationship between people, animals and the land, developing a deeper understanding and respect for the bond between the herder families’ livelihoods, their yaks, and the Mongolian landscape. Nancy discovered how the Khangai yak – an indigenous wild species found in the Khangai mountains of western Mongolia – could help preserve this nomadic way of life. These native animals support biodiversity and help to prevent land desertification by allowing plant species and wildlife to regenerate and thrive. Using her knowledge as a trained systemic social worker, Nancy wrote her first business plan on the back of a chocolate wrapper in a dimly lit ger (yurt). Back in London, with modest savings and the support of an extended network of friends in fashion, design, community development, marketing, business and product development, Tengri was born. Tengri’s 100% traceable and transparent supply chain ensures the integrity of garments and yarns which are sourced and created ethically and sustainably. The company adopts an innovative approach – minimising waste to do good. Nancy believes it’s wrong that up to 90% of raw woollen fibres sourced for the fashion and textile industry becomes unused yarn by-product. Through ioneering circular design, systems-thinking and curiosity, and respect for people, animals and the environment, the company designs and engineers innovative new products made of this precious by-product fibre, to support the livelihoods of our suppliers. Miller Libertine is a taste branding consultancy. It builds distinctive connections and loyalty at the deepest level between companies and their most valued clients. It combines stories with culinary excellence to create personalised multi-sensory edible masterpieces and dining experiences. projects vary widely ranging from bespoke confectionary and beverages to experiences such as brunch or afternoon tea. Annelise Scholl is a Brand and Communication design professional with a huge interest in Sustainability based in The Netherlands. She is developing sustainable cosmetics and believes in responsible innovation and sustainable business growth. She believes that through design, innovation and new technology we can harness the dynamics driving wealth so wealth generation and its expression through luxury consumption becomes a new and powerful driver for human progress. Her view is that the value of brands can be leveraged by increasing customer affiliation, where purchases are cultured, well educated acts that empower individuals in their pursuit for excellence. Gizelle Renee has created a premium British Glove company, carving out a market and reinventing the way people look at gloves. In a short period of time, Gizelle is selling internationally and working with some of the largest names in the industry. This year she has collaborated with a number of premum brands, most recently with Stefan Olsdal to release the rainbow glove; a glove made to demonstrate equality for all. Gizelle is highly commended for her entrepreneurialism and vision. Luxury knitwear company Belinda Robertson Cashmere has been at the forefront of the industry for decades. The brand has been going since 1992 when Belinda Robertson set out to make cashmere cool. From her infamous cashmere knickers to a completely bespoke cashmere service, the brand, which went exclusively onnline in 2010, is now undergoing a makeover. Olivia Dowie has joined the company as CEO as the brand enters a new stage whilst Belinda remains on board as Creative Director. The company prides itself on offering the highest quality knitwear in sleek and sophisticated silhouettes, as well as an industry-leading after sales service to extend the life of its garments. Charlie Stephenson has enormous experience in the luxury travel sector as CEO/ Manging Director of a number of high profile companies over the last 16 years. He was a Senior Executive within the Abercrombie & Kent Group for 11 years, Managing Director of Abercrombie & Kent Europe, launched Abercrombie & Kent Villas as a start-up, and before that General Manager of their Western Cape business in South Africa. More recently, he was one of three founding directors behind luxury tour operator Red Savannah Ltd, successfully taking the business from start-up to profitability. He has now been part of the Rocksure Group for the last two years developing that business and launching the all-new Rocksure Club.